Come one, come all! 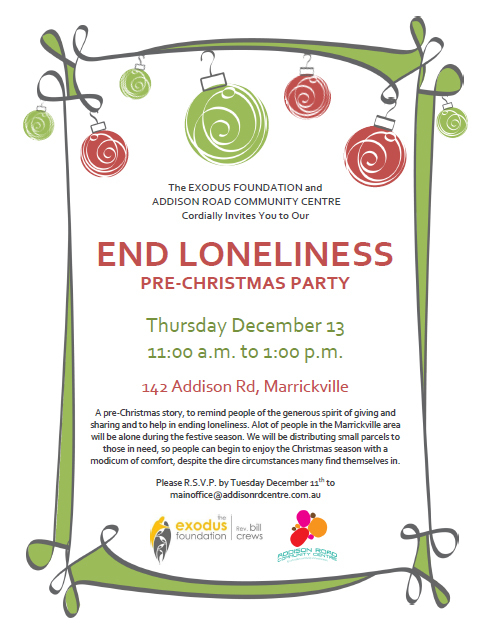 To The Addison Road Community Centre & The Exodus Foundation ‘End Loneliness’ Pre-Christmas Party at The Addison Road Community Centre. All welcome for an Xmas luncheon to remember the spirit of giving and to end loneliness. Thursday 13 December from 10am to 1pm. Xmas decorations by Reverse Garbage.